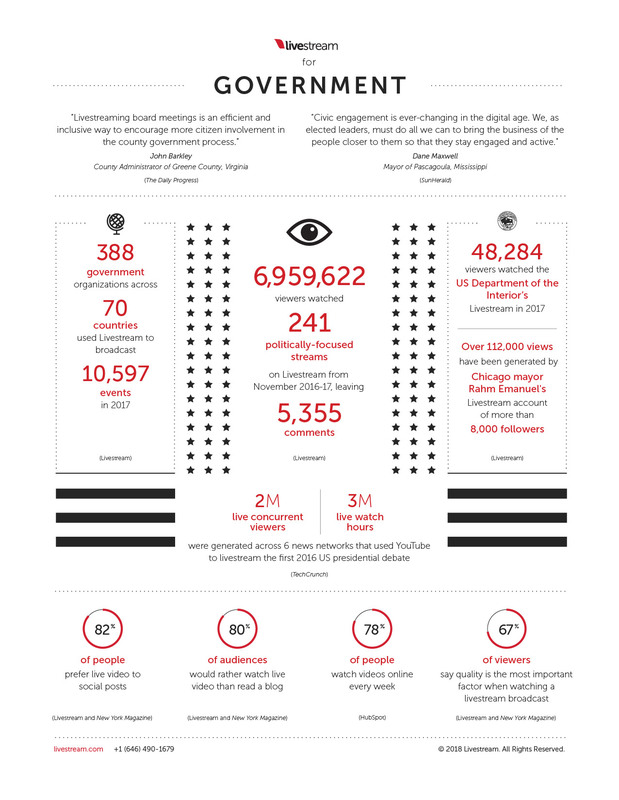 Livestreaming has become a valuable tool for governments to increase civic engagement. Governments of all sizes have taken to streaming city council meetings as a way to communicate their message to their community. Several cities such as the City of New York have passed bylaws that require local governments to start streaming city council meetings. By livestreaming, governments are demonstrating transparency and accountability; it also provides real-time and accurate information to citizens quickly and efficiently. According to a Nielsen Company audience report, the average American spends over 10 hours a day online. Technology has become an everyday part of our lives. Gone are the days where someone will physically make a complaint at city hall. They’re more likely to voice their concerns over phone, in a tweet, or an email. When constituents want to look up community events for the month, they are also more likely to look online. Streaming press conferences, town halls, and government meetings online gives governments and city councils a real opportunity to meet their constituents where they are. While constituents may want to attend every meeting, the reality is that they can’t always be physically present. You might be located far away, transportation might be a challenge, people may be on vacation. Give constituents the flexibility to fit your meeting into their day – whether by livestream or on-demand – and be rewarded with a more engaged audience as a result. Give constituents the option to watch the livestream at a time that suits them, from the comforts of their home, and they will very likely get more out of it and tune in more often. Many municipalities and governments are addressing these challenges and providing their residents with more ways to observe and engage by streaming city council meetings. In 2014, New York City passed legislation requiring all community boards to livestream their board meetings. The city of Austin, Texas streams 3,100 video clips to its residents each month. Many others in Arizona, North Carolina, Chicago, and Los Angeles are also streaming city council meetings several times a week on average. 6,959,622 viewers watched 241 politically-focused streams on Livestream from November 2016-17, leaving 5,355 comments. 48,284 viewers watched the US Department of the Interior’s Livestream in 2017. Over 112,000 views have been generated by Chicago mayor Rahm Emanuel‘s Livestream account of more than 8,000 followers, as of February 2018. 388 government organizations across 70 countries used Livestream to broadcast 10,597 events in 2017. 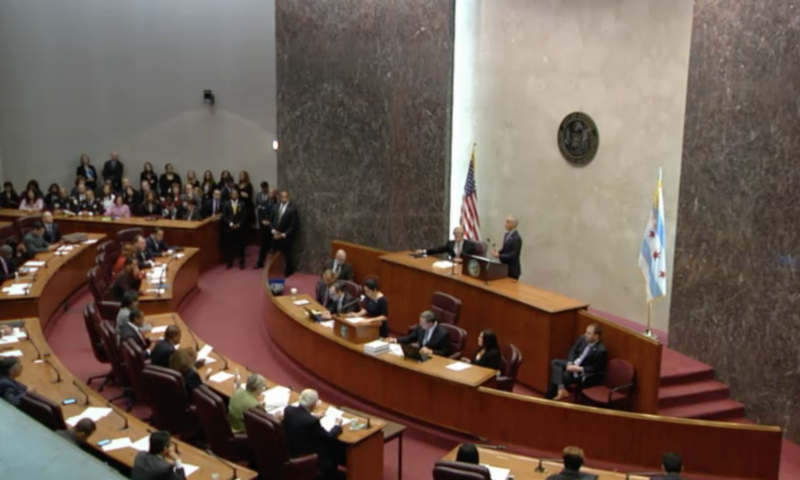 A livestream of a Chicago City Council meeting. Smarsh’s “Facebook Live: Best Practices” shares a few best practices to make livestreaming for your city council or government a success. #1 What Is the Purpose of Your Livestream? As with any strategy, your livestream should be built on a goal or purpose. Some considerations: Who is your target audience? What information do you wish to communicate? That purpose may evolve as your livestreaming efforts expand, but it’s important to bear in mind what the main focus of each livestream is, who you aim to reach, and how success will be measured. “LIVE” doesn’t mean “by surprise,” says Smarsh, an archiving platform. Announce, promote and share upcoming livestreams through your social media accounts and remember to direct them to the channel or platform you’re broadcasting from. Smarsh recommends regular scheduled broadcasts, such as a weekly or monthly community wrap-up, to build a consistent following over time. Do not underestimate the importance of training your live video representatives to ensure messaging of your organization is consistent across the board. Consistency and emphasis will help reinforce your livestream “as a knowledgeable and trustworthy source of quality information in the community,” says Smarsh. 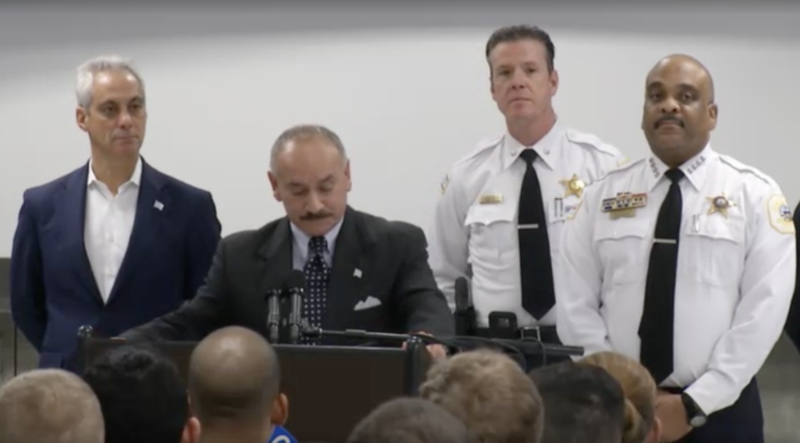 The City of Chicago livestreams its Police Academy Welcome. When livestreaming during an emergency, it’s worth noting that viewers are more likely to retain key information when they are repeated. Smash recommends repeating key details such as phone numbers, websites, names and locations at least three times during an emergency. They should also be shared on social media channels and your website. Whether it’s a livestream or on-demand video, make a habit of sharing or forwarding the content on social media platforms and encourage your viewers to do the same. “This built-in audience is essential to helping you spread the word to your entire community,” says Smarsh. Looking to livestream your next council meeting? Find a platform plan that suits your needs and budget.